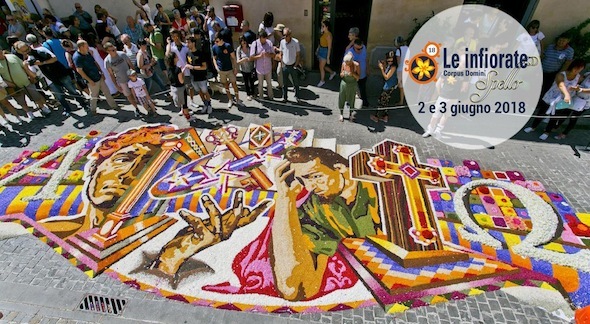 From 1st to 3rd June 2018, the appointment is in Spello where there are being the "Infiorate", the special flower festival that takes place in occasion of the "Corpus Domini" (on 9th Sunday after Easter, as every year). 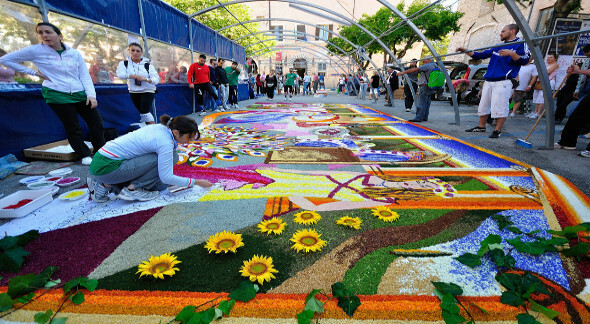 The picturesque town annually attracts hundreds of visitors who come from all over Italy and world to admire the splendid "Infiorate", that means carpets and paintings of flowers. Along the floreal city path, about 70 "Infiorate" are generally made, with carpets between 12 and 15 meters of lenght and pictures with a size between 25 and 90 square meters. A unique characteristic of the event is the choice of using only vegetable items, not treated by chemicals products or preservatives, nor artificial dyes. A magnificent and fragrant show, which fills with wonder and admiration! 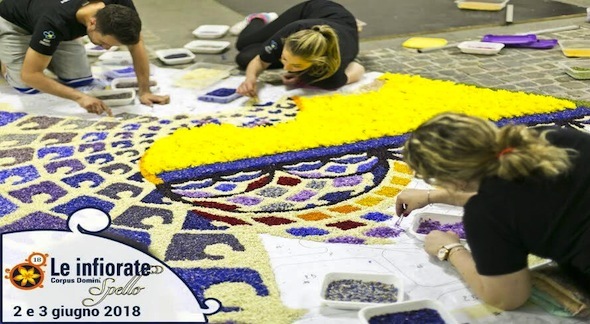 The floral decorations are made on the eve of the festival, with the execution of the drawings and the painstaking work of deposit and placement of millions and millions of colorful flowers and petals. The preparation of Infiorate is the most interesting part of the event: it starts in the early afternoon of Saturday - with the staging of the protections and the creation or reproduction of drawings on pavement sections assigned to each group - and it lasts throughout the night, when the "infioratori" (the ones who make the floral decorations) arrange with the maximum precision the petals on the drawings. And yet they have worked at the preparation of decorations for all the year, with the preliminary stages of research and collection of flowers, followed by selecting and preserving of petals, separated by color. 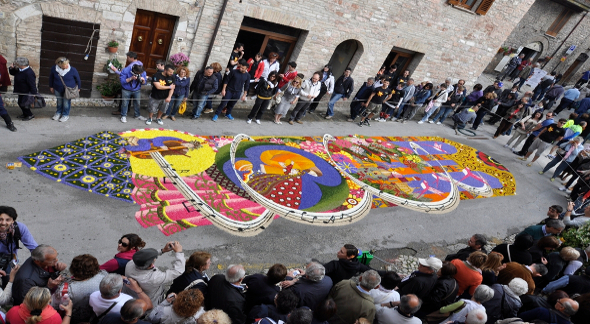 In particular for the Spring season, teams of "infioratori" from Spello are mobilizing to cross fields and valley of the Umbrian Apennine, especially near to Subasio Mount, and to pick up the petals of flowers needed. At 11 a.m. on Sunday 18th June, the procession will begin its journey through the city streets. After the passage of the procession led by the Bishop, the procession runs on the beautiful floral decorations. The precious carpets can be now be trampled and they dissolve in the air. on Sunday 27 th May, at 4.00 pm, Via Giulia. Opening of the Historical Photo Show by "circolo cinefoto amatori Hispellum"
FLOWERS NIGHT WITH … MUSIC, EXHIBITIONS, MUSEUMS, SHOPS AND BARS OPEN ALL THE NIGHT!! In the historical center, there will be an area totally dedicated to guests and visitors. 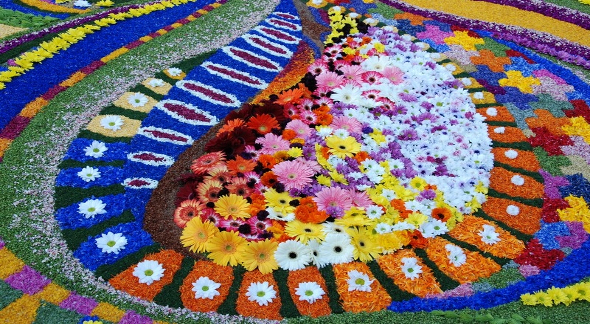 They will have the possibility of helping to realize a work of flowers, together with many local people ("infioratori"). There will be also a special area for children. 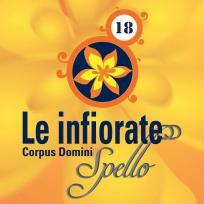 Holy Procession of "Corpus Domini"
>> There are many offers to stay in Umbria and Spello, find the best one for you and participate to the appointment with "Infiorate" in Spello! Also do not miss the most typical and genuine local cuisine at the "Infioratori" Taverns, with various special menu'!